I was just reading through ScifiGuy has his latest Weekend Report (tons of news, contests and other fun information) and found this gem. 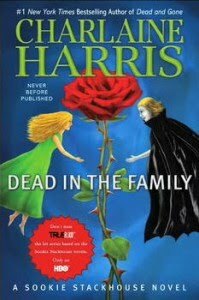 Check it out, it’s the cover for Charlaine Harris’s Dead in the Family, the next Sookie Stackhouse novel. In Weekly Geeks news, the polls have opened for the Book Bloggers Top 10 Books of 2009. It’s the second year this has been done and there’s another great collection of novels that were nominated. Alyxandra Harvey, author of Hearts at Stake, at Unbound! Nymeth at Things Mean Alot has posted the 43rd Bookworms Carnival and this stops topic is mythology. The retellings, stories based on them, primary sources and nonfiction – everything is there for the mythology lover. Realms of Fantasy has a whole new appearance on their website. To celebrate, they have a free copy of their latest edition available up on their website. One of the last Fifty-Two Stories of the year has been posted. This week, it is Belinda by Amity Gaige. Suburban Vampire is running their own Best Covers of 2009 poll and Catherine has some pretty hot covers listed. And speaking of best-of lists, io9 has posted their 20 Best Science Fiction novels of the decade. Fantasy Dreamer’s Ramblings is giving away a copy of Kelly Meding’s Three Days to Dead. Contest ends December 20th. Ann Aguirre is giving away Hell Fire proofs. We’re talking pre-galley draft. Contest ends December 19th.